The NFL Playoffs Are Here: Are We (and Am I) in For Another Magical Run? 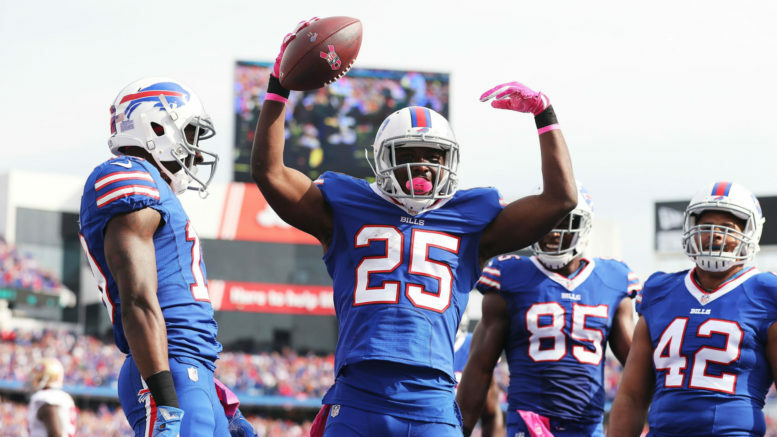 LeSean McCoy's health is a concern for the Bills, but don't sleep on them pulling the upset that would send them to Foxborough for a dreadful mismatch with the Patriots. A year ago at this time, it felt inevitable — the Falcons would get to the Super Bowl because the Cowboys never do, and they would lose to the Patriots. Six years after missing widely on that prediction, it came to fruition. I went 8-3 against the spread to finish the 2016 season at a robust 45-19 (.703). It wasn’t quite as rosy this year, but I enter January with a 30-24 mark for 2017, bringing my two-year total to a still-bustling 75-43 (.694). The playoffs are always a different animal, however, but again I feel undaunted. Wild card weekend, for the first time since 2006, features four home teams that actually had the same or better record than their opponent. Every year it seems we have at least one poor team that has to go on the road with a superior record, and sometimes in extreme cases like the 11-5 Saints visiting the 7-9 Seahawks in 2010 and the 12-4 Steelers visiting the Tim Tebow-led, 8-8 Broncos in 2011. Naturally, expect the Bills to keep it close at probably win because, well, you know why. A Buffalo win sets up the easiest possible matchup for the Patriots, akin to their 2016 tilt with the Brock Osweiler-led Texans and 2011 game against the Tebow-led Broncos. Seriously, what are the Titans doing here? It feels a little unjust that the Ravens and Chargers are sitting home, if only because those teams probably had a chance to win a game in January. The Titans most certainly do not. This team may have finally broken its eight-year playoff drought, but it hasn’t really taken a big step forward, and Marcus Mariota is a big reason why. The Chiefs are playing perfectly into my “got hot and forgot” routine, meaning they have a chance to actually win a game in the postseason. They haven’t won a home playoff game since Joe Montana was at the helm, so they are more than due. With the league’s leading rusher in tow and a quarterback playing for a big contract elsewhere in 2018, the Chiefs should have no problem with Tennessee. Andy Reid can usually be trusted in the early rounds of the playoffs and doesn’t figure to be out-coached by Mike Mularkey, who could still be on the hot seat. Pick: Chiefs. I’m taking both sentiment and logic here and, as usual, going against the patsy Falcons. Okay, so Atlanta won when it had to last week because the Panthers had an off day. But on the road against a fired up team that has big-time playmakers on both sides of the ball, the Falcons should return to being, well, the Falcons. Many feel the Rams could make a Super Bowl run out of the No. 3 seed, if only in large part due to the fact that the Eagles are a likely one-and-done candidate. But look for Wade Phillips to dial up some exotic blitzes to throw off the offense of one his former employers. The last time the Son of Bum coached in the playoffs, he led the 2015 Broncos to a lights-out, three-game stretch that resulted in a Super Bowl 50 title. The Falcons won’t be able to shake the bad memories of their last playoff game. You know, the one where they had a big lead down in Houston and all that… Pick: Rams. We know who the Patriots and their spoiled fans are rooting for here. If they had their druthers (and it usually seems like they do), Blake Bortles would go into his normal second-half choke routine and deliver the overmatched Bills to Foxborough on a short week and likely still without a healthy LeSean McCoy. That looms large in this game, though, because McCoy is as valuable to the Bills as just about anybody. Bortles is just fine when he has a lead, but if he gets behind, the Jags are in trouble. A fun little subplot here is Doug Marrone facing the team he surprisingly walked out on after going 9-7 in 2014. The Bills are dangerous because they are literally just happy to be here, and even though the Jags are too, it feels like there is still more pressure on them because people have been hyping them up all year. Buffalo hasn’t been in the playoffs since 1999, and the Jaguars haven’t hosted a playoff game since 1999. Both teams lost to the Titans that year. Look for the Bills to keep it close and possibly pull the upset, and then we can all just tune out the divisional round mismatches that will send Buffalo to New England and the Chiefs to Pittsburgh and gear up for the Steelers-Patriots title game everyone has been waiting for. Pick: Bills. Sometimes, these are the hardest games to pick, when you have two strong division rivals facing off and one has swept the other in the regular season. That is the case here, as Carolina lost two games to New Orleans by a combined 31 points this year. Since 1998, six of the nine teams going for the three-game sweep were successful, with the last occurrence being the Cowboys over the Eagles thrice in 2009. The Panthers did not look good last week in mustering just 10 points against the Falcons, and between health concerns and lack of big-play weapons, it’s fair to wonder if the Panthers can hang with the Saints in the Superdome. Drew Brees has not lost a home playoff game with the Saints (4-0), and Cam Newton lost his only previous road playoff game. Still, conventional wisdom says Carolina has the quarterback, defense, and head coach to keep this one close. I’ve been high on the Panthers all year because they’ve shown some serious grit in close games, and have scored some big wins against the likes of the Patriots, Vikings, Falcons, and Lions this year. New Orleans’ defense has morphed into one of the league’s better units, but has yet to be tested on the playoff stage, and it’s easy to forget the Panthers went to the Super Bowl as a 15-1 team just two years ago. Pick: Panthers. Be the first to comment on "The NFL Playoffs Are Here: Are We (and Am I) in For Another Magical Run?"